A mostly clear sky. Low near 40F. Winds light and variable. ELKO - &#8220We're the hometown airline, and hopefully we will grow with everyone here,” Xtra Airways President Lisa Dunn said at the airline's launch party. 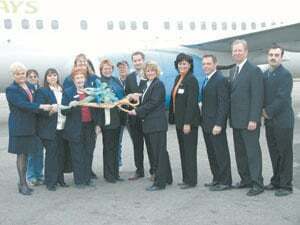 &#8220I am really surprised at the number of people from all over who are here,” she told the crowed packed into the former Elko airport terminal during the celebration of the new airline and arrival of the first jetliner with the new logo. There were visitors from Atlanta, Philadelphia and Dallas, to name a few of the cities represented. Iceland-based Avion Vice President of Business Development and Com-munications Magnus Stephensen echoed Dunn's statement on the airline's goal. Avion Group is an investment company with 61 aircraft, including airlines based in Iceland and England, and a shipping company. Stephensen said after the speeches that Avion has 85 offices and 4,500 employees. The company's investment is Xtra Airways is a closer tie, however, with Avion holding 49 percent of the Elko-based airline. Those at the open house were able to see the newly painted Boeing 727-800 that is the first of the new fleet. Xtra also is getting three Boeing 727-400 jetliners for its charter business. &#8220This is just the beginning,” Stephensen said. The jets Casino Express Airlines was using have been sold to Nigeria, he said. Xtra Airways is the new name for Casino Express Airlines purchased by four Casino Express managers and Avion. The new airline's founder-owners include Dunn, Ralph Nauman, director of operations; Sandy Davis, director of sales and marketing; Greg Kessler, chief pilot; and Avion Group. Davis said the airline has roughly 160 employees, when those based in other cities are included. The airline currently flies daily charters into Wendover, Utah, and has jets based in Boston, Cincinnati and St. Louis. The airline also is continuing flights for the Red Lion Inn & Casino's Casino Express program, although those flights are ending. Red Lion announced last week it was suspending its flights beginning Feb. 1. Red Lion left the door open to new charter flights, however, but the decision to end the gambler junkets will have an impact on Elko Regional Airport, which will lose money on landing fees and passenger utilization fees. There will be charters into Elko on occasion, at least. Dave Crawford, marketing director for the University of Nevada, Reno, Fire Science Academy, said before the ceremony Thursday that the academy already has booked a company that will charter flights from Xtra into Elko. Tesoro Golden Eagle Refinery will be sending students to the fire academy, he said. Xtra's planes will be flying from different airports, but the headquarters is in Elko. The airline's initial focus was to bring gamblers to Elko, but the airline later began offering charters, and the new owners are focusing on the charter business. &#8220Our safety record is unblemished since 1987,” said Dunn, who worked for Casino Express before becoming an owner in mid-July. Although the airline has been using the new name for a few months, Xtra Airlines became an official airline with the U.S. Department of Transportation this week, Dunn said earlier.